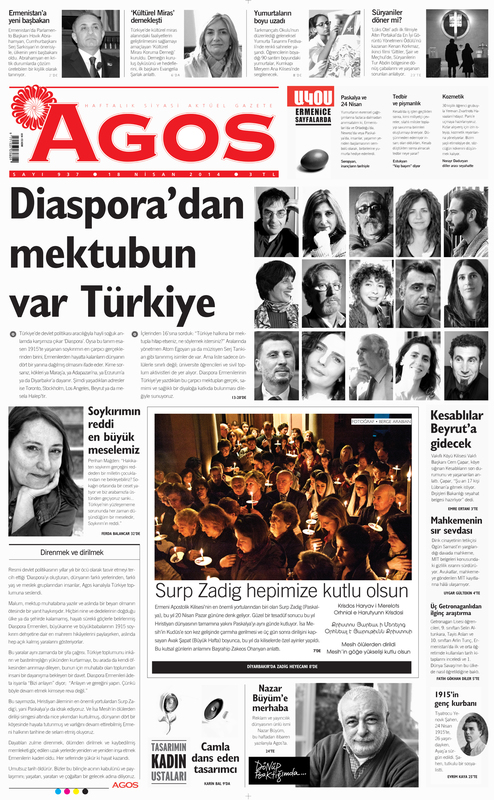 I was asked by AGOS Weekly in Istanbul to write a message to Turkey on the occasion of the 99th Anniversary of the Armenian Genocide, as were a dozen other Diaspora Armenian writers, academics, filmmakers, and artists. The letter is below. Beneath my letter is a response I received on this year’s Armenian Genocide Commemoration Day (April 24, 2014) via my author contact email. Jesus says to forgive your enemies, but what they did to us I never can forgive. What nation state did not rise or profit from crime? Israel was founded upon the violent expulsion and dispossession of hundreds of thousands of Palestinians. The United States of America was built upon land theft, genocide, and the forced labor of chattel slaves. The founding of the modern Turkish Republic entailed the extermination and expulsion of Armenians, Assyrians, and Greeks, and the harsh repression of Kurds. In order to justify these acts, the victims must first be made less than human in the popular imagination. After the fact, the story must be rewritten so that the despised, dispossessed, and murdered are said to have deserved their fates, and are made out, in fact, to be the perpetrators. My grandmother, Mariam Kodjababian Kricorian, was from Mersin, Cilicia. She and her family were forced to leave their home in 1915. They were sent on a death march to the Syrian desert. Her parents and younger sisters died on the road. She and her brother were among 8,000 Armenian orphans in a camp at Ras al-Ain. This was no accident. This was not the collateral damage of war. This was part of a concerted campaign to solve what was called “The Armenian Question” by destroying the Armenians. The goal was not only to rid Turkey of its Armenian inhabitants, but was also to appropriate their homes, lands and other properties. To the people of Turkey, I am not asking for an apology. I would like an answer, however, to this question: What purpose does it serve to continue to deny dignity, equality and justice to the Armenians? I read your letter to the Turkish people and as a Turkish person I thank you for saying things as they are. I wish I could call you an artist of my home country. I wish you could live in Anatolia and write beautiful, happy stories about Anatolian people. We miss all the Armenians, Greeks, Assyrians and other communities who used to be our friends, neighbors, our musicians, film makers, writers. I wish I could read you, William Saroyan and Elia Kazan in Turkish. I wish I could listen to Charles Aznavour in Turkish. I wish I could listen to Gomidas long ago.We are poorer without you, without all these communities who were forced out or killed by our criminal politicians. We were subjected to such levels of nationalistic propaganda, it took me a while to realize what we’ve done to our fellow country men. I am very embarassed to realize it so late. You asked a question in your letter: “What purpose does it serve to continue to deny dignity, equality and justice to the Armenians?” My answer is: to justify new genocides, atrocities by nationalists and racists. If they stop denying what we did to Armenians they believe they can not justify and avoid responsibility for what we did to Anatolian Greeks, Assyrians and others and what we have been doing to Kurdish people. I take this opportunity to tell you that I share your loss and pain, they are ours too.